Hawley's Billiards Parlor is located in the heart of north Dallas, just 2 blocks east of the famous Galleria Mall at 5623 Alpha Road. We have a total of 13 Brunswick pool tables with four 9' Brunswick Gold Crown tables, eight 8' Brunswick Century and Centurion pool tables and a 10' Brunswick Gold Crown Snooker table. Each table is covered in Championship Tour Edition cloth for fast and accurate playing. The tables are maintained to the highest standards for serious pool players and are arguably the finest equipment available for public play in Dallas. Despite our top-of-the-line equipment, our pool table rates are very economical. We charge only $4.00 per person to play as little or as long as you want from opening (10:30am) until 8pm each day and then only $5.00 per table per hour until closing. And if that weren't enough, we offer FREE POOL on Wednesday nights from 8pm until closing time (2am). There is no reason for your game not to improve if you come to Hawley's and speaking of improvement check out these tips on improving your game today! 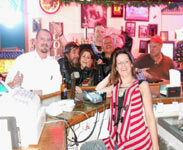 We also have a full service bar with a great selection of beers and all sorts of liquors also at terrific prices. We have tempting beer and liquor specials every evening throughout the week. In addition, we offer a great selection of food on our menu (Menu Page 1 and Menu Page 2) that will satisfy any appetite without breaking the budget. When you are not playing pool you may also have fun playing darts, foosball or one of our many video games or just relaxing and visiting friends in our lounge area. Or how about a game of poker on one of our poker tables. Since 1993, we have tried to anticipate your every need when it comes to enjoying yourself and having fun or just relaxing. 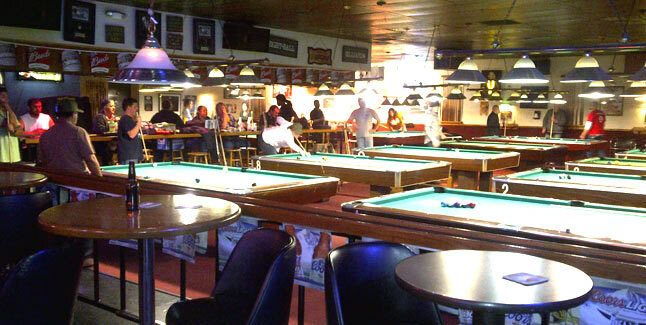 And if you have a special occasion to celebrate we will reserve as big a portion of the pool room as you need for your Birthday Celebration, Company Party or any kind of Pool, Dart or Poker Tournament, with special rates on pool time and food pricing that will make your wallet celebrate too. Just call the owner, Walter Hawley, at 214-632-9060 to have your questions answered and details attended to, and a good time will be had by all, guaranteed. 972-239-4846 if you have any questions or wish to reserve a table or two. Our friendly and hard-working staff are eager to serve you. Spring pool league teams are now forming at Hawley's Billiards for the APA traveling league systems. Please get in touch with me, Walter Hawley, if you are interested in joining or forming a team. You may email me at Walter@hawleys.com or call me at 1-866-POOL-CUE. 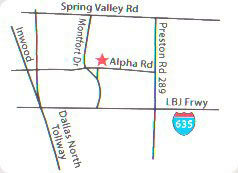 Or call Lori Way the APA director in our region at 972-422-7949. Shoot with the best for the price of a couple hours of pool. Everyone knows, that to get better at any sport you should play with those that are better. Trouble is, everyone wants to play with someone better unless its for money. So a $10 (all of which goes into the prize fund) Heads-Up 9-Ball tournament where you can play against the best for the price of a couple of hours of pool is the best of both worlds, where both worlds meet to exhange a few $ and a few Lessons. Hawley's Billiards even throws in an additional $3 per player into the prize fund!!! Come on out Tuesdays 8 pm for $$ or lessons, whichever. Contact Walter@hawleys.com for details or inquiries. Annoucing a Break and Run Raffle for every Hawley's Tournament! Every Hawley's Tournament, currently on Sunday, Tuesday and Wednesday at 8pm and Saturday at 1pm has a Break and Run Raffle where the pot has in the recent past reached over $800 or $80 per ball to run a 10-Ball rack of Balls. So every tournament player has a chance to win big $$$ and can even buy more chances at $1 for each ticket. Try it out , it's loads of fun, very challenging and the reward can be big. T.J. broke half the pot a few weeks ago and went home with over $400! "Hey somebody pick up that empty beer on the table!" Did you know that there are many trustworthy alternatives to playing live casino games? You can enjoy all your favorite games online at a top USA casino and the best part is you get to choose when and where you want to play. 2 Hours Free Pool GOOGLE Coupon - Get Yours Now! 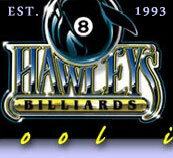 * The Dallas Observer awarded Hawley's Billiards the distinction of being Dallas' Best Pool Hall in 2007.